When the United States entered World War II, the Pentagon quickly bought up all the stocks it could find of .22LR target pistols — a .22-caliber handgun that fires a rifle-style cartridge—for training purposes. But the British Special Operations Executive was already using suppressed versions of similar weapons in combat. The United States soon followed suit. And today there are probably still some of those 1940s-vintage guns in the CIA arsenal. The British SOE’s favorite model of .22LR was the High Standard. Carl Swebilius established the The High Standard Manufacturing Company in Houston, Texas in 1932. At the same time, Swebilius also worked for Marlin and Winchester. When war broke out in 1939, High Standard began exporting Model B pistols to Great Britain under the Lend-Lease program. These were among the first pistols ever to feature suppressors. In 1942, the U.S. War Department purchased High Standard’s entire inventory, regardless of model. In order to meet skyrocketing demand, High Standard developed new gun that was simpler and faster to produce. The Model H-D became the most numerous — 34,000 had rolled out of factories by the end of the war in 1945. As early as 1942, the British government had modified Model B pistols with an integral suppressor that enclosed the entire barrel. In 1943, the American Office of Strategic Service requested a similar weapon. The result was the Model H-DM(ilitary)/S(ilenced), with a suppressor from Electric Bell Laboratories. Washington code-named the H-DM/Ss as “impact testing machines” and manufactured them in complete secrecy. The H-DM/S had a slide lock that prevented the gun from cycling and kept its action from making a sound. The ported barrel had four rows of eight — later 11 — holes. The propellant gases escaped into a zinc-plated bronze mesh that acted as a heat sink and slowed the gasses. A second chamber near the muzzle was filled with brass or bronze wire screens. A common OSS trick was to fill the second chamber with liquids such as water, oil or shaving cream — and seal the muzzle with tape. This method maximized the efficiency of the suppressor. The only sound the pistol made when firing came from the mechanical function of the action. The suppressor could reduce the pistols report to as little as 20 decibels. The mesh and wire screens lasted for up to 200 rounds before they needed to be replaced. ​One issue that arose was that the commercial .22LR lead ammunition the OSS initially used was not jacketed. The rules of war laid out by the Hague Convention required that combatants not use un-jacketed ammunition. Officially, the British began issuing jacketed ammunition. However, the OSS and SOE had few qualms about using pretty much any ammunition available, Hague Convention be damned. The SOE used its suppressed High Standards across occupied Europe, from France to Albania. The American OSS issued them to operatives throughout Western Europe and North Africa. They also saw service in the Far East and Pacific Theater. The SOE’s training advised that, for maximum effect, the shooter should place the pistol’s muzzle against the target. But technically speaking, the weapon was effective up to 50 feet. By the end of the war, High Standard had made approximately 2,600 suppressed pistols. At the end of the war, the OSS disbanded — but the organization’s inventory of suppressed High Standard Pistols passed to the Central Intelligence Agency when it formed in 1947. High Standard’s suppressed pistols continued to see service throughout the Cold War. 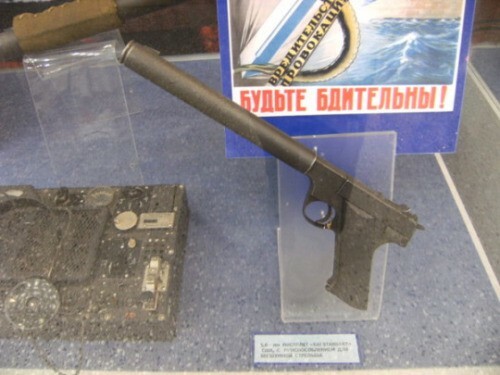 When Soviet air-defenses shot down CIA pilot Gary Powers’ U-2 spy plane over the USSR in 1960, Powers was allegedly carrying a suppressed H-D pistol. The suppressed High Standard pistols again saw action during the Vietnam War in the hands of CIA operatives and U.S. Special Operations Forces including Air America pilots, Navy SEALs and Army Green Berets. They were one of a range of suppressed weapons American agents used to assassinate enemy officers and Communist Chinese observers and carried during raids to capture high-ranking prisoners and missions into Laos and Cambodia. Perhaps the most high-value victim of a High Standard pistol was a North Vietnamese People’s Minister of Mobilization, shot in a crowded square. The operative who shot him escaped undetected. In 1967, Frankford Arsenal modified a number of newly-made pistols to use a new suppressor. These proved less efficient and more bulky than the original World War II-vintage pistols from Bell Laboratories. Officially, the suppressed High Standard H-DM/S pistols remained in CIA and SOF inventories well into the 1990s — and a number are probably still in use.